What is the health and safety problem? The workers employed in U.S. mining facilities are exposed to elevated levels of toxic aerosols including respirable dust, diesel particulate matter (DPM), and crystalline silica. Exposure to airborne aerosols can lead over time to debilitating respiratory diseases that can affect the health of workers. A comprehensive description of the respiratory health effects is provided on a dedicated Respiratory Diseases Mining Topic page. Monitoring can be used to measure and quantify a miner’s exposure to toxic aerosols. Personal monitoring is the most common approach to assess worker exposure, with an integrated sample or multiple samples taken from the breathing zone of the worker during a period of time that can be extended to a full shift. Monitoring an entire area (area monitoring) can also be effective, with multiple samplers used to characterize the level of toxic aerosols in the atmosphere during mining activities. Finally, monitoring a specific mining task recognized as a source of respirable aerosols allows for a complete understanding of the task and the needed control technologies. Traditional monitoring techniques are based on the collection of a representative toxic aerosol sample on a filtering media and later off-site laboratory analysis. For this analysis, NIOSH analytical methods have been designed to provide elevated accuracy and extremely low biases in the data. Unfortunately, these methods require time for the preparation of the samples, the analysis, and the generation of reports. The mine operators—by way of a safety and health department or industrial hygiene team—generally do not receive the results of the analysis until weeks after the sampling. For this reason, the use of these data in making decisions that will positively affect work practices and engineering changes is difficult and limited. How is the NIOSH Mining program addressing this problem? In 1996, in the context of a panel instituted by the Secretary of Labor to address the resurgence of coal workers’ pneumoconiosis (CWP), NIOSH received a mandate to improve personal aerosol monitoring instruments to provide "timely data output to miners." More immediate exposure feedback empowers workers and health professionals to propose and implement positive changes in the work environment. To meet this goal, NIOSH researchers have been focusing on the development of novel monitoring solutions that can allow mining operators to make a more timely assessment of the toxic aerosols levels in the air. These solutions involve the identification of advanced analytical technologies, modifying and applying these technologies to the specific mining need, and generating and evaluating the resulting prototype technologies. Mining operators are actively engaged in the process by providing comments and feedback and by testing the prototypes. What are the significant findings? In recent years, NIOSH research has generated products and knowledge related to the monitoring and assessment of exposure to coal dust, silica, and DPM. 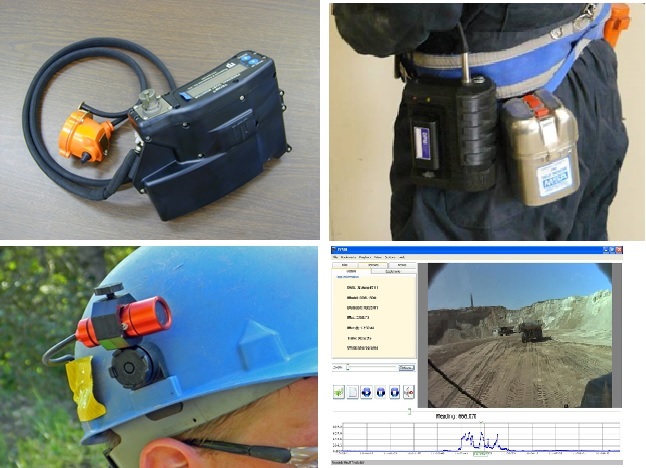 NIOSH researchers developed a direct reading personal dust monitor (PDM) for measuring miners’ exposure to respirable coal mine dust (RCMD). The PDM is a belt-worn monitor that collects a representative dust sample drawn through a sampling train from an inlet located on a miner’s cap lamp. The PDM has been included in the proposed Mine Safety and Health Administration (MSHA) coal mine dust rule as a new enforcement sampling device. NIOSH is exploring the use of remote dust monitoring via light detection and ranging technology (LIDAR). LIDAR could monitor the coal dust cloud from a far distance and allow a more comprehensive investigation of dust propagation and effectiveness of control technologies. NIOSH has also developed a near real-time elemental carbon monitor that is now commercially available to assess DPM concentrations in non-coal mines. NIOSH researchers also played a key role in the development of the DPM exposure limit introduced by MSHA in the last decade. To monitor exposure to respirable dust at mining operations, an innovative direct reading approach has been developed. Since its development, this innovation has also been adopted for use by the construction, manufacturing, and oil and gas industries. This exposure monitoring technology (Helmet-CAM) combines the outputs of a real-time dust monitor and of a video camera worn by workers to identify work activities and locations of elevated exposure. This approach was found to be particularly effective for mobile workers whose activities are variable; for these workers, it might otherwise be difficult to identify the cause of high exposure levels or to assess the effectiveness of specific control technologies. Part of this Helmet-CAM assessment technology developed by NIOSH is the EVADE (Enhanced Video Analysis of Dust Exposures) software. The NIOSH-developed EVADE software merges the data from the dust monitor and the video camera for simultaneous analysis to enhance the use of the information collected by both. Finally, NIOSH researchers have also recently identified novel technologies to allow for end-of-shift measurements of silica in mining environments. The use of these technologies is being explored to allow mine operators to assess worker environments for self-compliance. NIOSH researchers will continue to improve monitoring solutions for the assessment of miner exposure to silica, respirable dust, and DPM. More timely and field-based methodologies for the monitoring of silica in every mining environment are needed and will be investigated. The personal dust monitor technology will be advanced in order to offer a more user-friendly, light, and compact device. The monitoring of DPM in mining environments will be improved in terms of optimized metrics and technology. An upgrade to the EVADE software to include diesel, noise, and other toxic substance data analysis will be completed. Finally, potential application of optical remote sensing technology to monitor dust sources and movement over extended areas will be further evaluated.